China Yiwu International Trade City District 4 opened on October 21, 2008, with construction area of 1.08 million square meters. There are more than 16000 booths and over 19000 business entities in total. 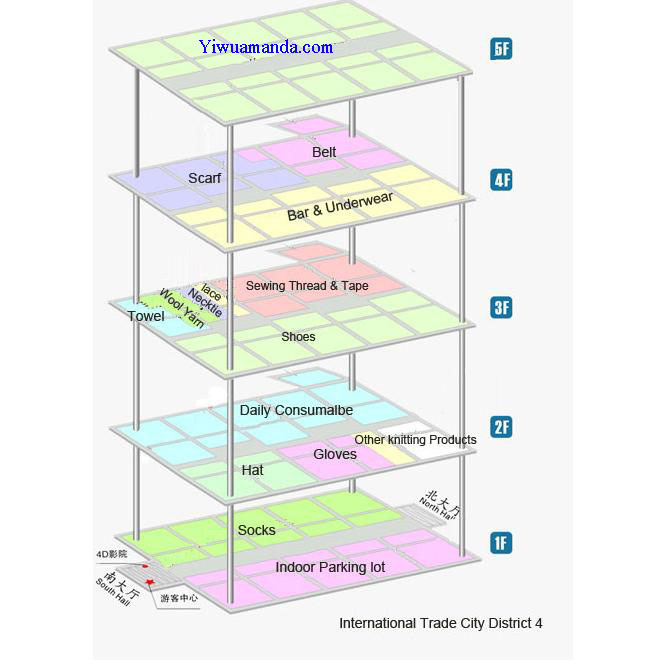 The 1st floor deals in hosiery and socks, the 2nd floor for Daily Necessities, gloves, hats and other needle cotton fabrics, footwear, Shoes, wool, towels, lace, neckties on the 3rd floor, bra underwear, scarves and belts, straps on the 4th floor. It provides a full range of services including modern logistics, E-business, international trade, financial services, accommodation, etc. The market was equipped with 4D Motion Cinema, tourism shopping and other special commercial services. China Yiwu International Trade City District 4 used the advanced design concept of international large-scale commercial center in current. The market was equipped with central air conditioners, Large-scale electronic information screens, broadband network system, LCD TV systems, solar power generation facilities, rainwater collector, automatic sunroof and parallel escalators and others High-tech equipment. China Yiwu International Trade City District 4 is the highest scientific and technological content, the highest levels of international commodity wholesale market in China. It also is a modern landmark in Yiwu.